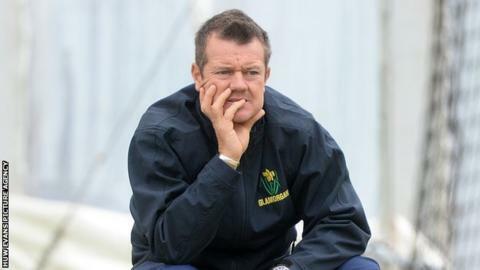 Glamorgan head coach Toby Radford wants more consistency from his bowlers after two draws from their opening county championship matches. Surrey declared on 563-7 in their first innings in Cardiff, while Leicestershire managed 435 against the Glamorgan attack. "I think we've bowled well in patches," said Radford. "It's doing it as a pack, bowling in pairs or as a group of four or five and we just weren't able to do that." Radford added: "I think Michael Hogan will definitely help and we hope he'll be fit for Derby." Glamorgan sit out the third round of games before taking on Derbyshire at the Swalec Stadium on 3 May. Australian strike bowler Hogan has missed the opening two matches of the season with a hamstring injury. Radford was pleased with the result against Surrey after Glamorgan had slumped to 210-5 on day three, still needing 204 runs to avoid the follow-on. "It looked as though it was heading one way but we showed a lot of fight with Dean Cosker batting 110 balls and supporting Craig Meschede who made a fantastic 100. "We bat a long way down this year." He was less interested in the media focus on Kevin Pietersen after dozens of journalists arrived to watch the former England batsman try to force his way back into the international reckoning, making 19 and 53 not out. "I think people want to come and watch star players they've seen playing in Test matches around the world," said Radford. "It's fantastic [Sri Lankan batsman] Kumar Sangakkara was here, [but] a shame as a Glamorgan coach watching him. "But he's a wonderful player and I'm sure people enjoy watching him play as much as they'd watch someone like Kevin Pietersen play." Glamorgan will have this weekend off before resuming nets on Tuesday and are also planning a practice T20 match against Gloucestershire before the Derbyshire championship match.